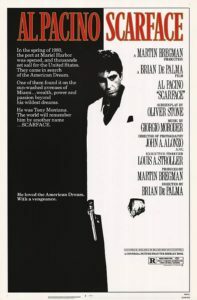 029b – Scarface (Part Two) | All Eighties Movies. All The Time! I know this film is not a comedy but you both made me laugh. Thank you. I love this movie. Love to have drinks with you two. So much fun! Best podcast review of Scarface ever. And Australians too. Nice Cuban accents. ‘Push it to the limit’ ultimate montage song could not agree more! I’ve now listened to both Scarface podcasts twice from you both as you just nail it. Will be telling friends about you – promise.